Behind all credit card debt, you’ll find a money personality type. If you want to get to know the true character of others, watch what they do, not what they say. That especially applies to how people treat money. Most importantly, it relates to individual self-awareness about attitudes surrounding personal finance and in particular issues surrounding credit card debt since those little plastic cards have become so much a part of daily life. Too many of us give too little thought to how our money mindset shapes our handling of finances, and we continue to act in ways that are contrary to our best financial interests. The trick is to learn about your own money personality. Then, if need be, you can take steps to change your behaviour. Here I offer views of six common money personality types. You might ask yourself where you fit into the picture. Are you a Big Spender on the loose racking up credit card debt, or are you a Debtor who avoids dealing with life’s financial realities? Are you a Shopper who is driven to fill holes in your heart with goods from the mall, or are you a Hoarder who is fearful of living life fully? Then again, maybe you’re a Saver or a smart Investor, treating money with the respect it deserves and enjoying the fruits of your wisdom. Read on to determine which personality type might apply in full or in part to you. • Hey Big Spender, spend a little time on this. As a Big Spender you’re no bargain hunter. You spend like the devil and it makes you feel like a god. Shiny new cars. The latest tech gadgets. Cool brand-name clothing. Extravagant gifts. Maybe a house that’s bigger and better than the Jone’s spread next door. You go for it. You love to splurge. Credit card debt is no big deal to you. You’re a status seeker, equating material goods with self worth. All the stuff makes you feel important, adored, and validated. Problem is, life is fickle. Fortunes change. Plus, as someone once said, man does not live by bread alone. Not only that, if you haven’t the means really to spend big, you’re surely headed for debt problems. You may have to step back, scale back, and put together a thoughtful monthly budget. In the process, consider all the wonderful things in life that don’t come with a price tag attached. As the song goes, the fundamental things apply as time goes by. And they can cost nothing at all. Don’t miss out on them. • Debtor, what exactly are you avoiding? As a debtor you’re somewhat like a Big Spender in that you don’t care much about how you spend. As a matter of fact, you take pains to avoid dealing with the everyday realities surrounding personal money management and things like credit card debt. It’s not so much that you love to spend money; it’s more a matter of you can’t be bothered about issues relating to monthly budgeting, tracking your spending, financial planning, and goal setting. You procrastinate. You hem and haw. You don’t keep tabs on things. Uncomfortable with the subject of money, you often turn your thoughts elsewhere. Unfortunately, because of your attitude, you can easily build a reputation for being irresponsible, cheap, lazy and either stupid or devious in relation to borrowing and spending. All told, your attitude makes you a prime candidate for problem debt and sets you up for all the grief that comes with having debt collectors hounding you. You need to buck up, get financially literate, and put your money where your brain is. 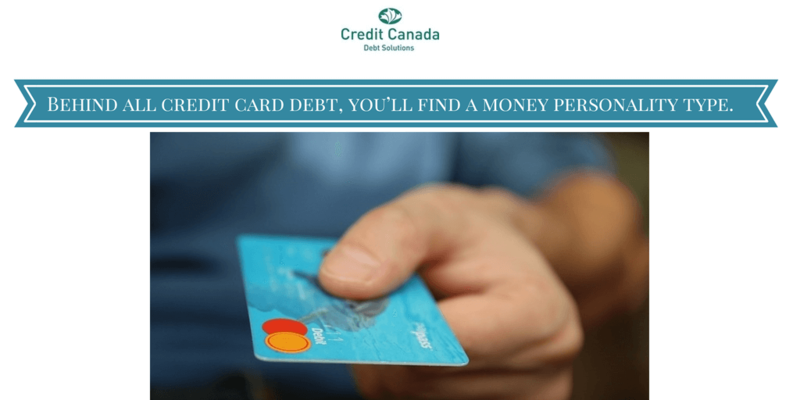 Call us at Credit Canada. We can help. • Shopper, you may have another price to pay. Shopper, you are another character who shares something in common with the Big Spender. Your reach may be smaller – and status may or may not be an issue in your life – but your drive to get emotional satisfaction from spending is very strong indeed. It often can become a serious addiction. Curiously, unlike the Debtor, you probably care about money. You’re likely aware of the fact that you’re buying stuff you don’t really need, but you can’t help yourself. You may even be concerned about credit card debt. Still, you go on. You love bargains. Shopping entertains you, soothes you. It relieves you of boredom. More than that, shopping seems to fill emotional holes in you. So you’ve got some soul searching to do to get to the root of what’s missing. Start by taking a frank look at the day-to-day things that trigger your desire to get your shopping “fix.” Then, as research shows, you are likely to find ways to replace the fix with other non-material interests and pursuits that bring lots of pleasure without a lot of spending. • Hoarder, remove that clutter from your head, too. Hoarders can take a lesson from what I’ve stated about shoppers; both can reflect addictive behaviour. While shoppers try to fill emotional holes in their lives with material things, hoarders seek psychological security through all the stuff that they buy and collect. As a hoarder, you might be fearful that one false move will put you in the poor house. Also, you can end up with attics, garages, and even rooms full of stuff that can soothe you by its mere presence but that threatens to bury you at the same time. This neurotic tendency to hoard, to try to buy emotional security, and to pull back from life can badly affect your relationship with others. You may come across as stingy and as a bit of a weirdo, rejecting life’s pleasures and disappointing family and friends by being ungenerous. You’ve got to look within the personal factors that lay behind this fervent need for security. Start by taking baby steps towards loosening up. Humour yourself with some adventurous – but always well considered – spending on yourself and others. Take a few calculated risks in your investments. While you’re at it, throw out all the unnecessary junk you’ve collected. You might be surprised by the joy that comes with letting go. • Saver, I see your saving grace. Saver, by my definition of you I have to say that I admire your spirit and wisdom. Most often, you don’t spend too much, you don’t spend too little, and you know exactly how you’re spending. You respect money, understanding that it is a tool rather than a bother or a psychological crutch. You follow a written monthly budget, you’ve set financial goals for key life wants and needs well into the future – plus you’re always in control of your credit card debt. Through savings and sound investments, you’re prepared for just about any financial contingency – including emergencies. You’re my kind of people. • Investor, you’re attitude is invigorating. A tip of the hat to you, too, Investor, whose title here I frame within the context of smart investing. True, there are many wild and woolly investors who throw caution to the wind and make dumb decisions that create trouble. But these folks often fall within the category of the Big Spender or the Debtor. The Investor I’m concerned with brings to mind the likes of Warren Buffet, whom I greatly admire. As an Investor of this character, you share many of the traits of the Saver, but you are particularly savvy about money and you are very aware of its power to help make life pleasurable both for yourself and for others. Driven by informed financial decision-making, you stand as a shining example to others. So there you go. An overview of what I see as some of the world’s main money personality types. Of course, I’ve offered broad strokes here. Lots of commentators provide many more variations, covering more specific – or perhaps even broader – psychological ground. If you, dear reader, can think of additional interesting types, please share in the conversation.